ith 40 harvests under his belt, Winemaker Rob Davis knows his way around the vineyard… and the cellar. Although reluctant to share, Rob reveals his four secrets to making the best Russian River Valley Chardonnay in this post. His approaches spotlight the fruit, freshness and minerality in Jordan’s elegant Chardonnay to create a balanced white that has sommeliers and wine lovers alike confusing it with wines from the famed French Burgundy region. We blush. The Russian River Valley wine region’s foggy, cool coastal influences create a natural air-conditioning for vineyards during spring, summer and fall. This allows the grapes to develop full flavor maturity over an extended growing season, sometimes up to 20 percent longer than neighboring Sonoma County wine regions. These weather patterns are ideal for cool-climate varieties, particularly Chardonnay, affording grapes an uncommon depth and richness while still maintaining bright, natural acidity. When Davis matches this cool-climate-loving grape with gravely, well-draining soils along the river, the result is grapes that are fresh and lively, with crisp acidity to add length and complexity. The exposed gravel in the soils also imparts elegance and minerality to the wine. When it comes to crop size, less can be more in the vineyard. Having an intimate understanding of each vineyard’s optimal number of clusters per vine—not too many or too few—yields a better wine. “Too much fruit leads to weak flavors and going too extreme with lower tons per acre makes the vine focus energy away from the fruit and into growing a vigorous canopy,” Davis says. “Under-cropping also leads to less fruitful buds the following year.” Davis spends twice as much time in our Russian River Valley Chardonnay grower vineyards than our Alexander Valley Cabernet Sauvignon grower vineyards to give the additional attention Chardonnay vines need so that the precise amount of clusters remain and ripen perfectly throughout the summer. Ranch Manager Brent Young has also taken over farming for two of our most prized grower vineyards—a decision that costs more than letting the grower tend to the vines, but allows for the ultimate control over grapevine uniformity and fruit quality. A balanced vine means a balanced wine. Night harvests create cooling magic for the Russian River Valley Chardonnay from Jordan’s growers. Starting at midnight, floodlights illuminate vineyards where workers gather plump bunches of grapes. By dawn, temperatures can drop to the 40s. 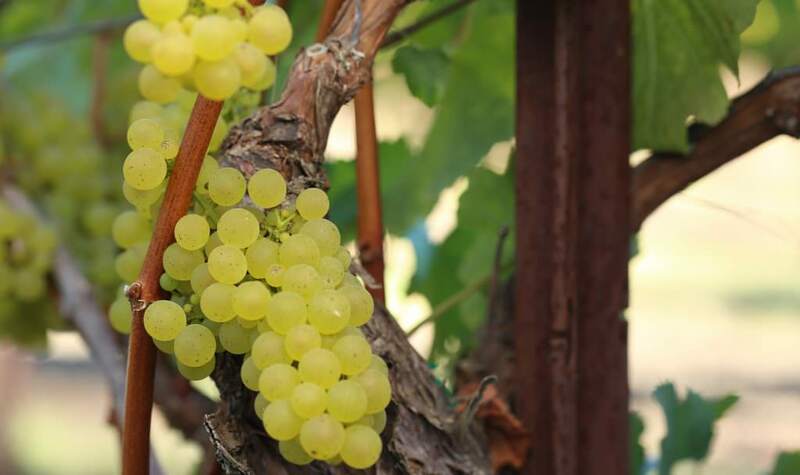 When those chilly clusters are pressed, they release heady aromas of apples and pears. “Harvesting in the coldest hours preserves acidity and elevates both aroma and flavor. You see the purity of fruit coming through,” says Davis, who calls himself “a humble student of Chardonnay” even though he has been making wine at Jordan Vineyard & Winery since 1976—a rarity in California. Night harvesting by hand is also more expensive, but the resulting elevation in vibrant flavors, bouquet and acidity is worth it for Jordan. Quality without compromise is our mantra. All this attention to detail underscores the winemaking philosophy that has guided Jordan since the inaugural 1976 vintage: craft wines of balance and elegance that can stand with the best in France. Our Russian River Valley Chardonnay showcases flavors of Fuji and green apple that play off fresh Meyer lemon and lime zest, sustained by vibrant acidity. A creamy mid-palate glides to a lingering finish, with a juicy succulence that makes you want to take another sip. Previous Previous post: What Makes a Good Wine Bar?